Can you describe how Wild Azur Natural Skin care first came about and where the idea came from? I first witnessed the power of Frankincense Sacra essential oil when my husband started using it, after a friend’s recommendation to help him heal some angry moles caused by over-exposure to the sun. His moles totally disappeared within a few weeks and having passed the oil onto my mother, who achieved similar results, this was a real ‘wow’ moment. I became captivated by the miraculous healing properties of pure essential oils and frankincense in particular. I started to make my own body balms, home-made insect repellants and sun tan lotions, which were all highly effective. Friends would often take some home and tell me how amazed they were at the results despite their initial reservations at my ‘hippie potions’. I never set out to work in the ‘beauty industry’ and don’t consider that wild azur is really part of this, more the health and wellness industry. Our products are youth enhancing by nature but are also healing and medicinal to some degree for both body and mind. The anti- cancerous properties of the frankincense sacra for example has shown some incredible results. My journey – I literally burnt out just after giving birth to my second daughter. I didn’t realise it at the time but looking back I was sick, depressed, overwhelmed, anxious and fatigued from working too hard in the corporate world, 2 businesses, a baby and a toddler to manage and neglecting my own personal needs and wants. I healed myself through nutrition and use of medicinal herbs, plants and oils but I realise that even now I am still learning, healing, growing and this should never stop. I love sharing my experiences to help others. I recently became a yoga instructor and have learnt so much more than the nutritional side of things. The power of the mind and our self belief systems are fascinating. When I had my own children, I developed a deeper interest in nutrition and general awareness of looking after the body and these new pure beings – wanting the best for my kids and realising what awful harmful ingredients were generally thrown into food and skincare. I studied anatomy and physiology, became a Neal’s Yard representative and trained in reflexology/ Indian head massage but being a mum was always the priority and the best gift in the world. The big inspiration for me came on a trip to Bali ( where we live now) where we took the family on a Green camp – this was so eye opening – the hindu culture- the people so happy and smiling and helpful was so infectious. I wanted to know what they were doing when they had so little to be always so content. Living simply in yurts, learning about organic farming, medicinal herbs and plants, making chocolate from the cacao plant on site, climbing coconut trees, making a raft and floating down the river, learning about sustainability. These were real life lessons we were learning and getting down with nature and mud wrestling, laughing yoga – so many wonderful experiences. This was the turning point for me and the pull became too strong not to find something to channel this need to inspire and educate, to live naturally, to love and look after our bodies and be kind to our planet in the process, leaving it well for future generations. What does Wild Azur mean? ‘Wild’ meaning – raw, earthy, authentic, stripping back artificial layers, from nature, most natural form – wild product, wild woman, wild true self. ‘Azur’ meaning – serene, water element ( intuitive, emotional, runs deep like a river), natural blue sky/ blue sea, flow, calm turquoise waters of cote d’azur where I used to live. luxurious. Describe Wild Azur in 3 words. Where are your products made and where do you source the ingredients from? All the products are currently handmade and hand poured in the UK and delivered direct from us to the customer. Ingredients are sourced globally after much research, such as the rare wild harvested frankincense sacra from Oman, the rosehip oil from Chile, the apricot kernel oil from Italy, and the lavender from provence in the mountains behind where we used to live in france. The thought of it reminds me of the incredible smells of the lavender fields. Do you think the attitude towards eco and natural products have changed over the last few years? There is definitely a change in attitude towards eco and natural products but the products themselves are fairly unregulated and it is difficult for the consumer to trust in what they are buying. It’s really important to be clear about what is in the products and the educational element of why it is of benefit. What are the benefits of using 100% natural beauty products? The skin is our largest organ, absorbing 80% of what we put on it, whether that be body creams, moisturizers, sun tan lotion, insect repellents, deodorant or body oils. When left to its own devices, the body heals and re-balances itself through it own natural processes. Quite simply, it’s a universal truth that our skin responds best to natural, organic, healing plant extracts and oils that derive directly from the earth rather than toxic, synthetic anti-ageing formulations or chemicals that modern society has come to rely on. If it’s not good enough to eat then you shouldn’t be putting it on your skin either. What products were you using before you created Wild Azur? 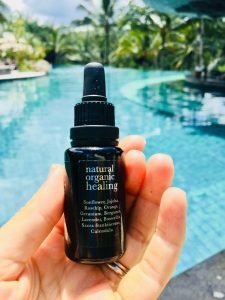 I had been using safe, non-toxic cosmetic and skin products for some years and while I had discovered some amazing brands there were no totally ethical and pure, clean brands with natural, organic, healing and wild harvested ingredients so I started to buy individual ingredients and make my own for a good 5 years leading up to starting wild azur. Which Wild Azur product could you not live without? When I was formulating the luxurious frakincense face serum, I knew this would be the best seller of all our products. It has the most perfect combination. An intensely moisturising but not greasy serum and the most divine smell that immediately lifts me. I love knowing that I’m applying a delicious cocktail of power packed collagen boosting and restoring vitamins, antioxidants, fatty acids and healing plant oils and herbal extracts that all work in harmony to rebalance and rejuvenate my skin. I even use it as a lip balm now so no lines there either! What are the future plans for Wild Azur? I am excited about developing the range of products but continuing to research the absolute finest of ingredients in the process. I am loving the growing community and the feedback, support and enthusiasm and the feeling that we are a recognised and trusted brand. Gandhi quote ‘ Be the change in the world you want to see’ kept resounding with me. If you have any more questions you can contact Clare on info@wildazur.com or click here to view the full product range. Receive a 50% discount on all Wild Azur products by using Code: NOURISH50 at the Checkout. It sounds like a great product. I have used you code and bought some products!